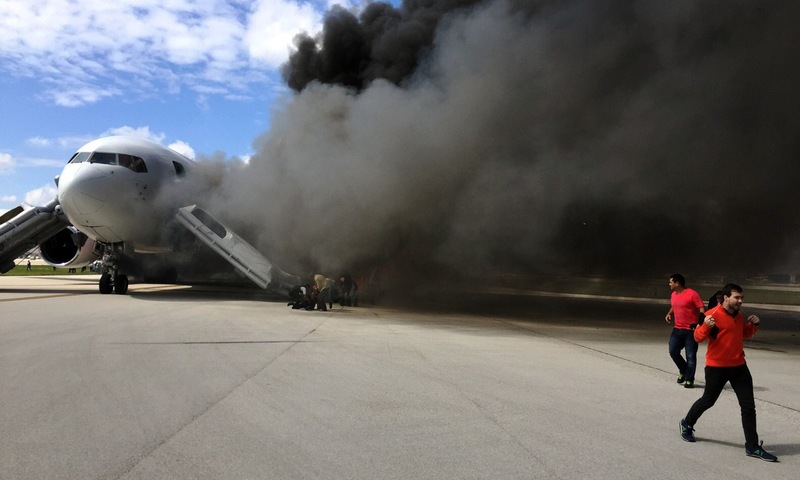 14 people were injured on Thursday in the Fort Lauderdale’s International Airport, when a boeing 767 carrying 101 passengers and crew caught on fire on the runway. As reported on “The Guardian”, Broward Sheriff Fire REscue spokeman Mike Jachles declare that one person was seriously injured and about a dozen other people were taken to the hospital for minor injuries. The owner of the boing was the Dynamic Airline, and it was en route to Caracas, Venezuela. It was taxiing for departure around 12.45pm when the aircraft behind it on the runway reported that fuel was leaking, the FAA said. “The left engine caught fire on departure,” said Alan Siegel in an interview on CBS News. The fire was quickly extinguished. Two local stations reported there were 101 people on board. Miami’s ABC News affiliate WPLG aired a recording of an audio conversation with the pilot of a plane behind the Dynamic flight. David Magro, 22, and his sister Daniela Magro, 20, were flying home to Venezuela for a cousin’s wedding. He was reading his iPad when she saw smoke outside. Fear erupted in the cabin, which was about half full with travelers who jumped from their seats. The siblings, both students in Melbourne, left belongings, including their cellphones, behind.